An offspring of the dynamic art scene that thrives in Reykjavík, Sequences Real Time Art Festival is an independent biennial that aims to produce and present progressive visual art with a special focus on time-based mediums such as performance, sonic works, video, and public interventions. Sequences VIII features a selection of artists and performers, many of whom engage in cross-disciplinary collaboration. The hub of Sequences VIII will be the newly opened Marshall House, home to the artist-run spaces The Living Art Museum and Kling & Bang. The festival will also take place in other artist-run and publicly funded locations throughout Reykjavik. A blossoming off-venue program will be presented alongside the curated program. While Sequences uses the term “real time” to refer time-based media, “Sequences VIII: Elastic Hours” considers how the term might be applied to the experience of art making, exploring how artists manipulate time as a raw material. Stretching, echoing, and inverting hours, the works included in Sequences VIII often go beyond standardized metrics such as clocks to investigate alternative systems for measuring and experiencing time. These works remind us that our daily rhythms are not solely determined by tradition and locality but also rooted in the natural forces, beyond our control. The passage of time is acutely palpable in Iceland in particular, as with the region’s seasonal extremes in the duration of daylight hours and mercurial weather conditions. In charting the passage of time through unconventional means, the artists included bring heightened awareness and critical insights into our relationships with objects, society, and the universe around us. Since the late 1960s, Joan Jonas (b. 1936 New York. Lives and works in New York) has created groundbreaking multidisciplinary works that investigate time-based structures and the politics of spectatorship. Her projects often simultaneously incorporate elements of theater, dance, sound, text, drawing, sculpture, and video projection. They rely on alternate identities, narrative symbols and threads, but they also refuse linearity, privileging instead the doubled and fractured tale. A pioneer of video art, Jonas began using the Portapak video system in 1970 to explore the shifts that occur from the camera to the projection to the body and the space of the live action. For her recent videos, performances, and installations, Jonas has frequently collaborated with musicians and dancers and has drawn from literary sources and mythic tales in realizing her multi-layered explorations. For Sequences, Jonas will present a solo exhibition at the Living Art Museum, which will include a selection of works from throughout her career—from her early videos Wind (1968) and Song Delay (1973) to stream or river or flight or pattern (2016/2017), a project that she conceived on recent travels to Venice, Singapore, Nova Scotia, and Vietnam. 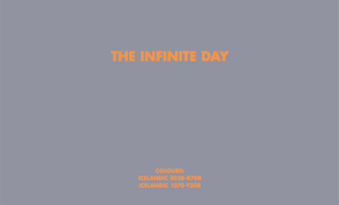 Birgir Andrésson, The Infinite Day / Endalaus dagurinn, 2005. Wallwork / Wallpainting, household paint, size variable. Courtesy of the Estate of Birgir Andrésson and i8 Gallery Reykjavík. The Living Art Museum, Kling & Bang, and the Icelandic Art Center are responsible for Sequences and this eighth edition is organized by a team including curator Margot Norton, producer Edda Kristín Sigurjónsdóttir, and the board of Sequences. For those travelling onwards to mainland Europe or US, Icelandair offers a stopover in Iceland at no extra cost. Joan Jonas, Song Delay, 1973, film still. © 2018 Joan Jonas / Artists Rights Society (ARS), New York.